Atlas editions faberge egg. Nest of pearls. Large Blown Ostrich Egg - Great for Arts and Craft Projects -See Photos. Large Blown Ostrich Egg. Condition is Used. It is possible to carve it, decorate by painting it or embellishing with beads, textiles or paper. 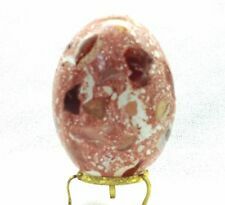 Egg - a souvenir is made of Epoxy resin with natural Baltic amber inside and insect. Material:amber & synthetic resin. 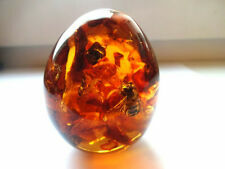 Amber is about 50 millions years old, fine and always fashionable product of nature. PAPIER MACHE EGG ON EGGCUP--VERY COLOURFUL ITEM IN GOOD CONDITION. 2 nice real hand made Ukrainian Easter eggs. These are hen's eggs, that are emptied ( hand blown) and painted by using a traditional wax technique, then lacquered. Pair of Blown Ostrich Eggs/ Collectable /Decoration. This is a wooden egg painted with a picture of a Unicorn. It is used but, it is in good condition. The egg has been emptied and cleaned, REPAIRED AND PAINTED to blend in with the unique coloring of the egg. Back of the Egg abbreviation Christ is Risen. 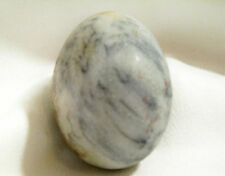 This EGG is a wonderful Gift Idea and can be a great addition to any collection. ORIGINAL 19th CENTURY. Antique 1914-1915 Imperial Russian Porcelain Easter Egg with Empress Alexandra Feodorovna C ipher and Red Cross on The Other Site. Each year 5000 of them were produced. A small portion was marked with a red cross and those eggs were given by the Empress in the charity hospitals to wounded soldiers. Circa 1800's. Original condition, no sign of restoration. Size H 3 3/4". Material: wooden (linden) egg, tempera paints, kolinsky brush. "Easter Bunny-Girl ". Artist/autor of original personage is L.Romanova Copy by V.Grashina. She's the lead artist of our Studio. Circa 1800's. Original condition, no sign of restoration. Size H 2 7/8". Height about 12cm ,real green Ostrich Egg Shell ,NO SCRATCH, CRACKS OR STAINS, all eggs have a hole at the botton. You are Buying only one with random, We will send you the best one available. I present to you a real handmade Chicken EGG pysanka. The creator and designer of this pysanka is Oleh Kirashchuk. To make it, used traditional wax, resist to technics ("batic"), and used the traditional tool, pysachok (kystka). Beautifully etched all over. The Hospice aims to bring peace, comfort and dignity to patients and families facing the crisis of serious illness. Silicone Candle Mould. Candle mould made in the UK from silicone. Includes 5m of wick. The candle is an Egg Shape. (code TS635). Candle will weigh approx 50g when made. A lovely porcelain egg, inspired by the Faberge eggs, produced by Heirloom Porcelain, from the Jewelled Splendour collection. When the music box is wound up from below it plays the tune ' On the Wings of Love'. To make colors last longer pysanky are covered with several layers of UV protection. All eggs are hand blown, washed and processed thermally. not to be re-distributed, copied, imitated, or misappropriated in any way. VINTAGE SMALL PORCELAIN CHINA HAND PAINTED CHINESE EGG ON CARVED BONE RING. A SMALL PORCELAIN PAINTED EGG SITTING ON A CARVED CHINESE SCENE BONE RING. 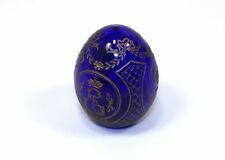 Empress Maria Feodorovna Porcelain Easter Egg. decorated with a gilded cipher of Empress Maria Feodorovna (mother of Tsar Nicholas II). The egg is covered with dark red and lilac glaze known assang de boeuf (ox blood) with a slip creating pale blue highlights. 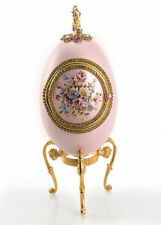 The egg is with its authentic filigree casing in the shape of an egg with an Orthodox cross on top. 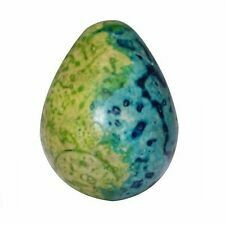 An Old Antique Egg Made of Russian Malachite from Ural Mountains. Both the egg and the filigree casing are in good condition. I present to you a real handmade Goose EGG pysanka. The creator and designer of this pysanka is Oleh Kirashchuk. To make it, used traditional wax, resist to technics ("batic"), and used the traditional tool, pysachok (kystka). 5 nice real hand made Ukrainian Easter eggs. These are hen's eggs, that are emptied ( hand blown) and painted by using a traditional wax technique, then lacquered. Lot of 10 sets. Blank wooden egg. Size: 9 cm (3.5”). Materials: natural wood. Only handmade. These Beautiful Pysanky from Western Ukraine are painted using traditional batik technique with beeswax and kistka. All work is not wooden! These are real chicken eggs. Pysanky are made by hand, at high artistic level. The egg has got small holes at each end. 12 nice real hand made Ukrainian Easter eggs. These are hen's eggs, that are emptied ( hand blown) and painted by using a traditional wax technique, then lacquered. To make colors last longer pysanky are covered with several layers of UV protection. All eggs are hand blown, washed and processed thermally. Any and all publishing and reproduction rights are reserved solely by the artist and are. 6 nice real hand made Ukrainian Easter eggs. These are SMALL SIZE hen's eggs, that are emptied ( hand blown) and painted by using a traditional wax technique, then lacquered.